Magna International Inc. supplies the new Maybach Zeppelin ultraluxury car's outside mirrors, which have been designed to reduce wind noise. The angular design features an enlarged mirror surface together with integral indicators in the shape of a horizontal V. Magna also supplies the Zeppelin with other high-quality items such as carpets, sun visors and body side mountings. Webasto AG is responsible for producing some of the more luxurious interior parts for the Maybach Zeppelin, such as its electro-transparent panoramic roof. Occupants can allow the sun to shine clearly through or make the roof opaque with the touch of a button. The structure spans the roof liner above the rear passengers and features an opaque liquid crystal membrane of conductive polymer plastic. When an alternating current is applied to it, the crystals in the plastic membrane are arranged in such a way that the glass becomes transparent and allows daylight into the rear of the vehicle. Webasto, of Germany, also supplies an auxiliary parking heater to maintain an ambient temperature inside the vehicle. All Maybach vehicles are propelled by the same V-12 bi-turbo engine. The standard versions have 5.5-liter displacement and 550hp, while the more agile S versions boast 612hp out of a 6.0-liter engine, with immense torque of nominally 900/1000 Newton meters. These results are achieved using pistons, valves oil and fuel filters from Mahle GmbH and cylinder head gaskets and turbo flange gaskets from Dana Holding Corp. The Zeppelin's front and rear axles are supplied by ThyssenKrupp AG, which also provides the car's shock absorbers and steering gear. The front axle features a double-wishbone suspension, full air suspension system with level control, whilst the rear axle is a multi-link independent suspension, with level control, anti-squat and anti-dive control, and torsion bar stabilizer. 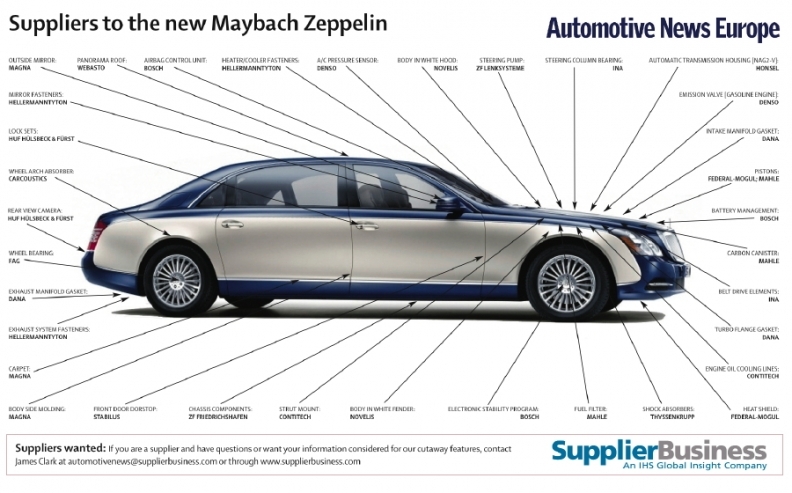 The Maybach brand Daimler AG's rival to BMW AG's Rolls-Royce and Volkswagen AG's Bentley. Maybach's one product is produced in Sindelfingen, Germany. There are currently four variants of the Zeppelin, starting with the Maybach 57, which starts at 340,900 euros excluding VAT, and rising to the top-of-the-range Maybach 62 S with a price tag of 458,200 euros before sales tax.